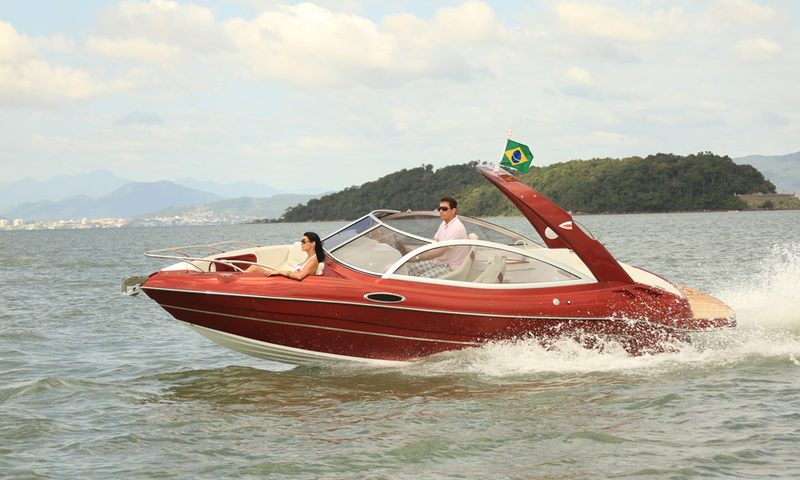 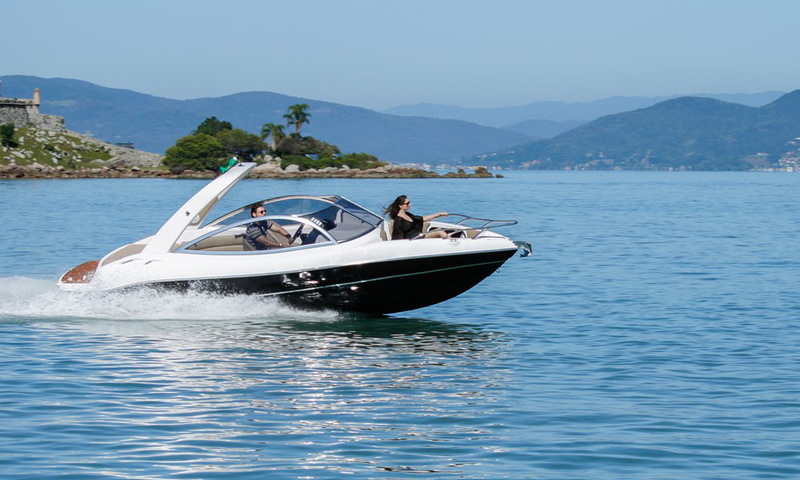 The FS 230 Sirena was developed for the passionate about boating, those who spend whole days riding with many people on board and look for space and comfort for their passengers. 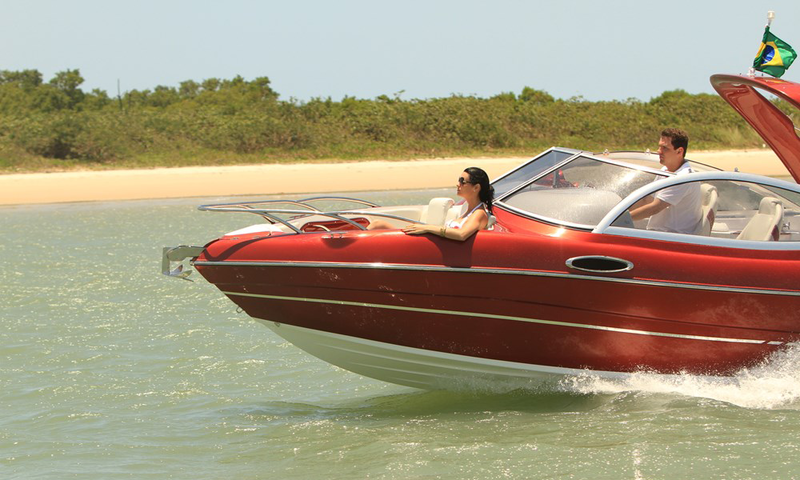 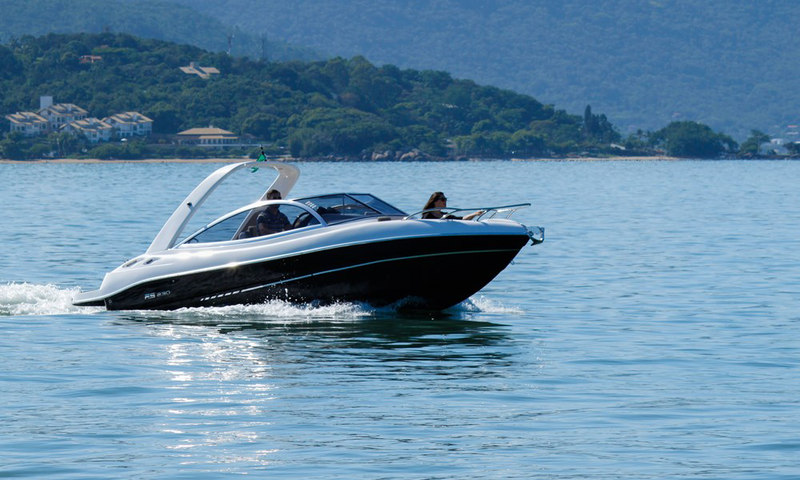 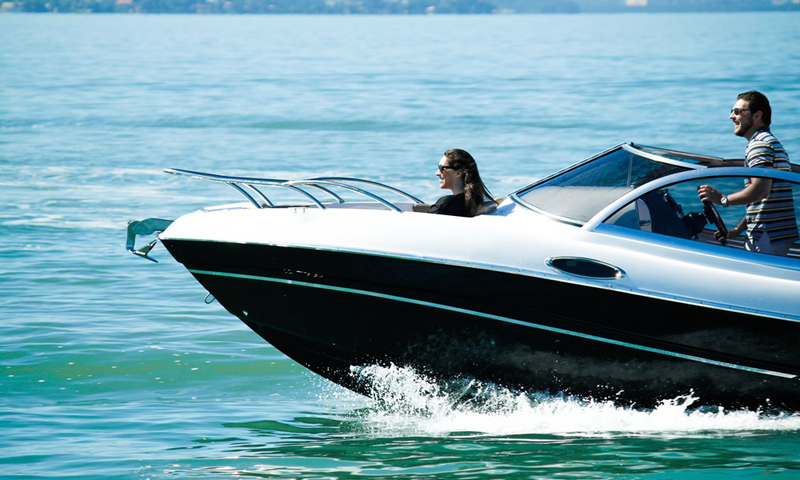 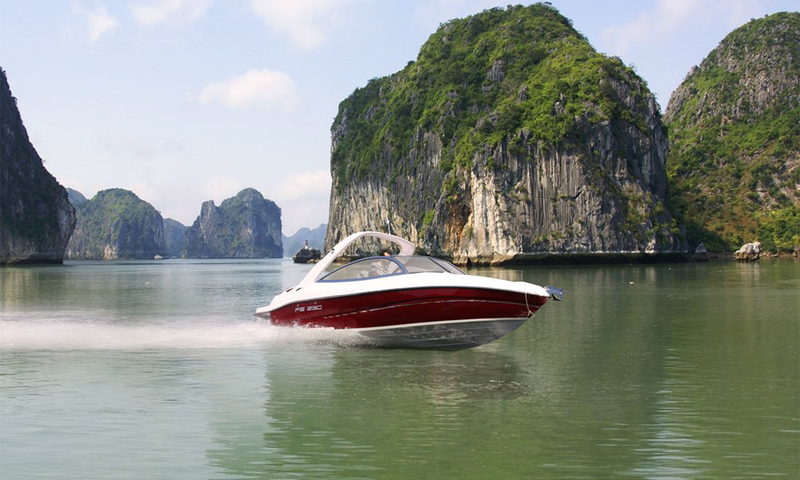 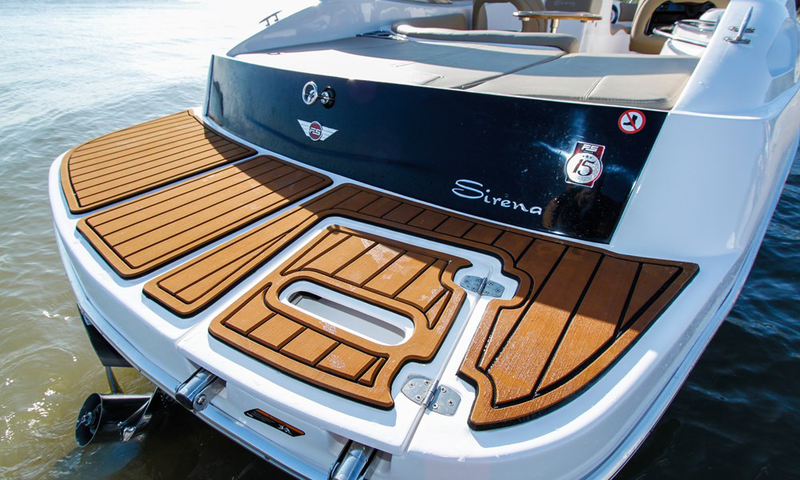 The FS 230 Sirena pioneered the use of sterndrive engines, being the first of many small-sized motorboats to offer the technology, performance, and comfort never seen before on motorboats of its category. 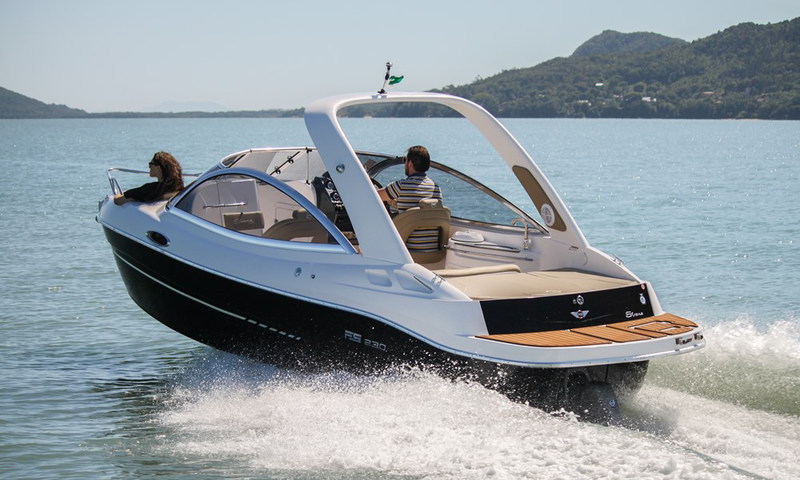 Its forward-leaning fiberglass tower, a hallmark of the FS Yachts’, impresses by enlarging the apparent size of the watercraft and also provides a larger area of shade on the boat when the Bimini canopy is open. 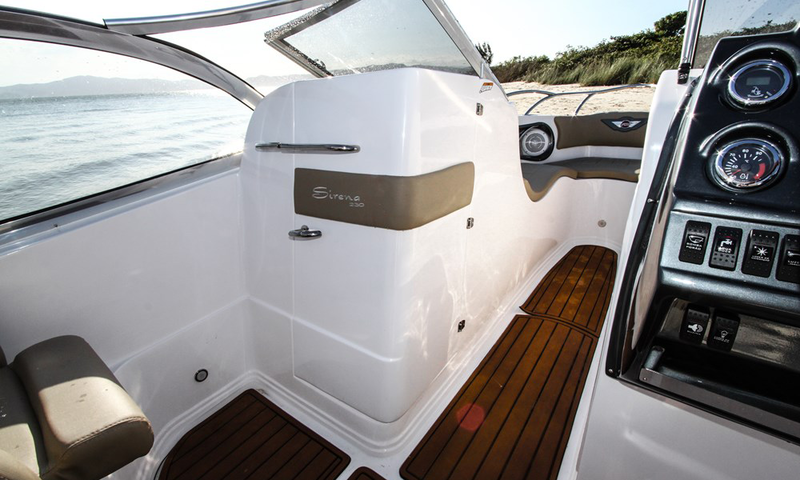 From the aft deck to the sundeck, through the cockpit and to the open bow, the FS 230 Sirena has an excellent internal space, similar or superior to larger-sized motorboats. 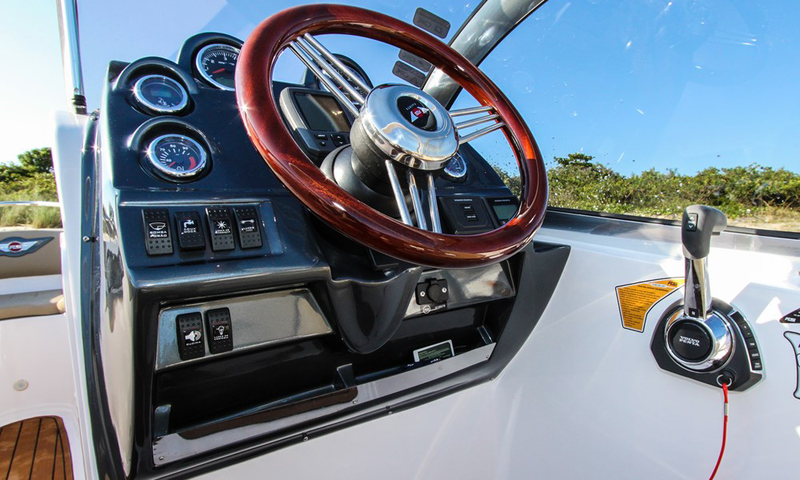 The space gained from the use of a sterndrive engine is amazing. 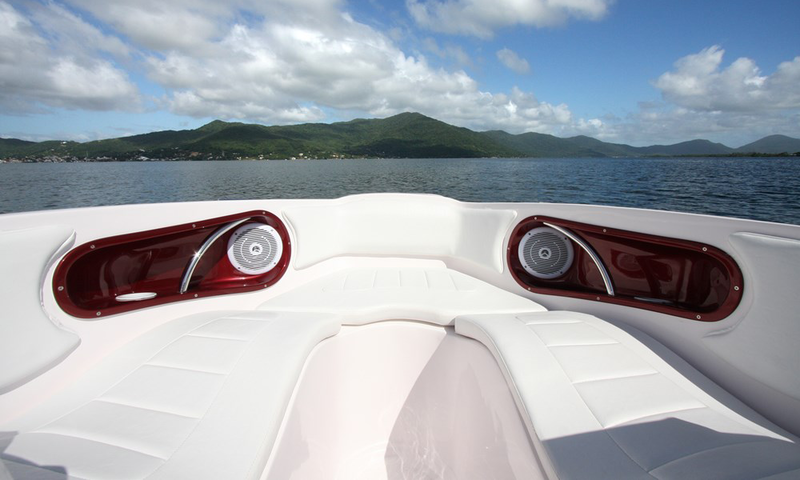 The aft deck is the favorite place of most passengers due to its easy access to the water. 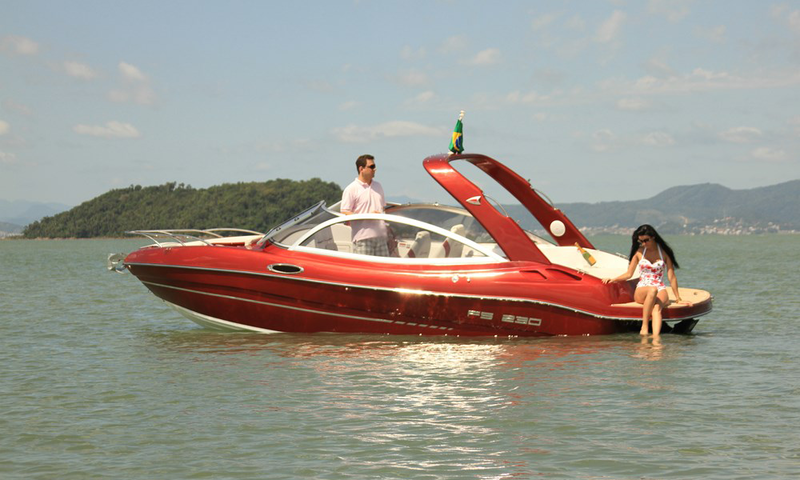 Moreover, it facilitates putting the wakeboarding boots, for example. 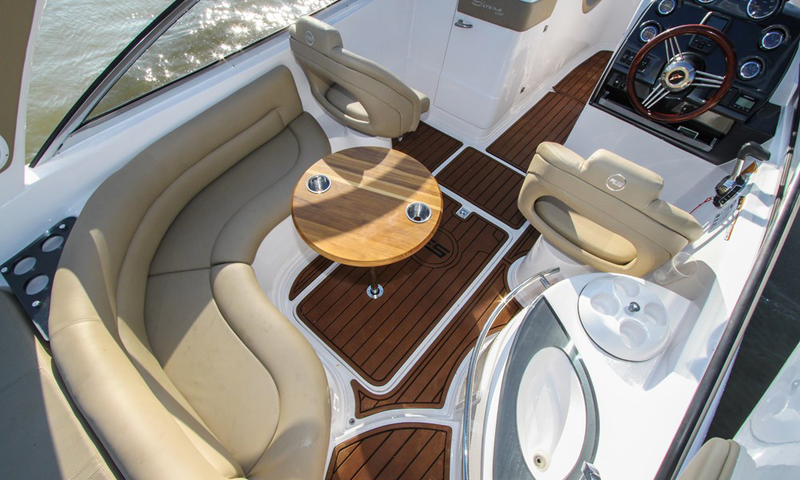 The aft sundeck, which is just above the engine, offers room for a couple to lie down comfortably in the sun. 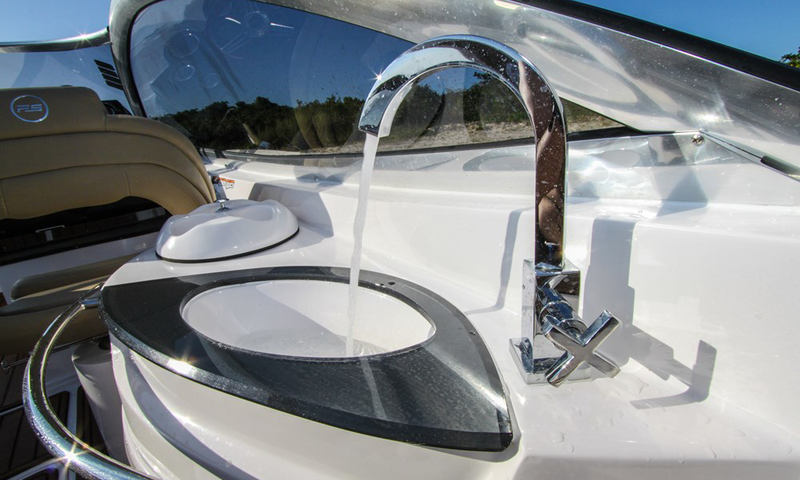 In order not to give up comfort, this motorboat features – as a standard item – a closed bathroom with toilet, window with opening, and hygienic hand-held shower so you can extend the tours and deliver comfort for your passengers. 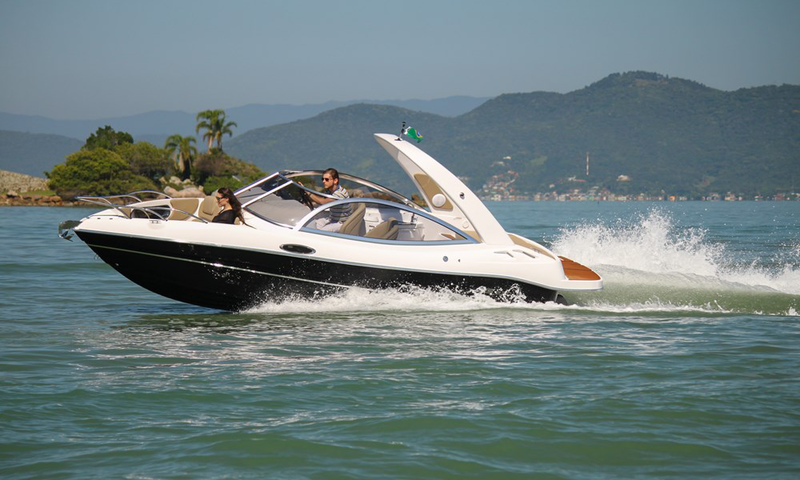 The excellent internal space with open and airy hatches and portholes, a private bathroom with a washbasin w/ tap, a hand-held hygienic shower, and a trashcan, as well as other standard items, are among the distinctive features of this motorboat. 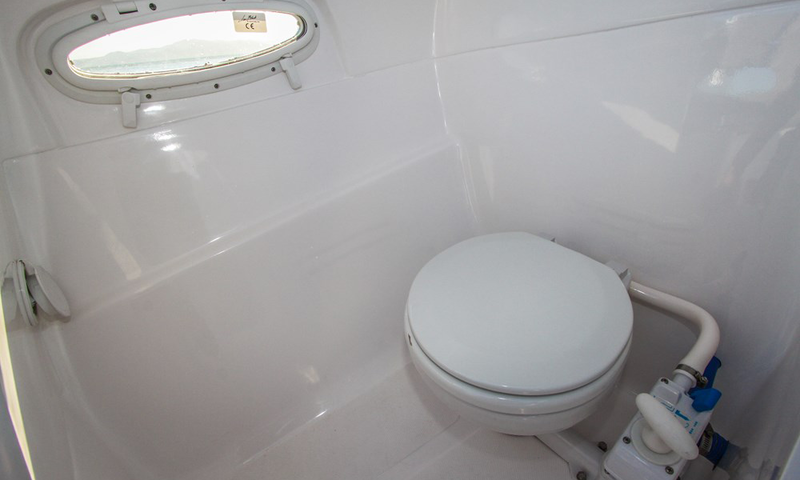 The closed bathroom affected a bit the space provided for the bed, but according to the shipyard’s technical team, this design option was accepted because less than 10% of people riding an FS 230 Scappare would regard the bed space as a priority item whereas, on the other hand, the bathroom comfort would become an attractive feature. 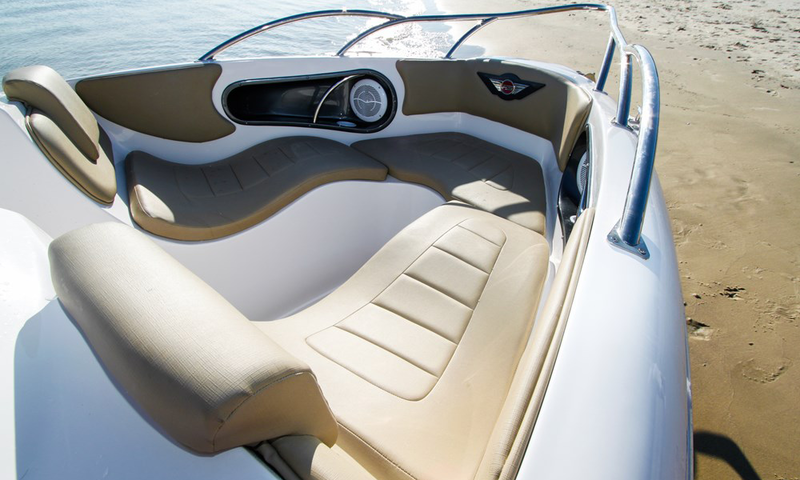 The boat features a U-sofa in the cabin, whose upholstery is made of leather-like vinyl w/ mildew protection; several color options are available, like sand, caramel, brown, terracotta, white, and cinnamon. 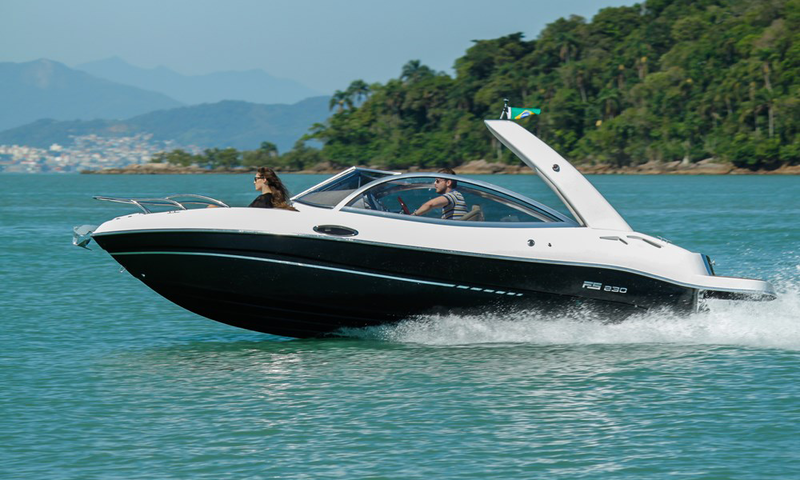 The FS 230’s open-bow model has been named FS 230 Sirena. 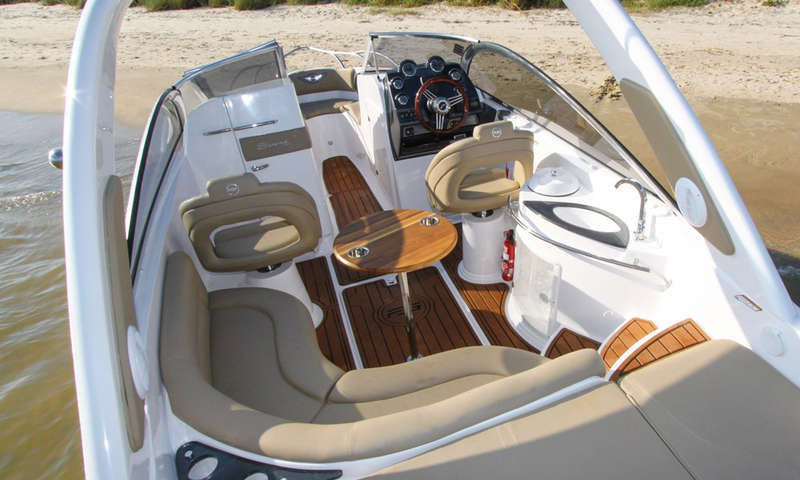 In this version, a closed bathroom in front of the co-pilot is part of the infrastructure.